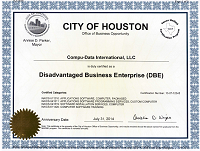 CDI is proud to announce their certification as a Disadvantaged Business Enterprise "DBE" by the city of Houston. This certification will increase CDI's exposure to state agencies and the general public. View a copy of the certificate.